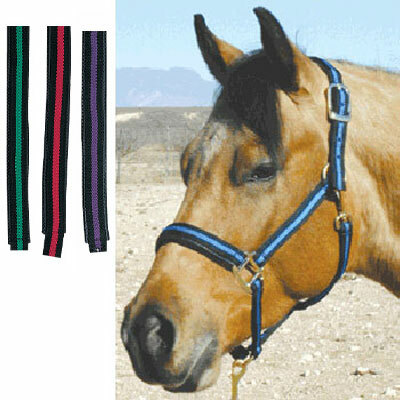 Neoprene Padded Halter No Rub! PVC coated foam padding on crown and nose. Comes with swivel snap at the throat and heavy duty hardware. A very attractive pattern with black stripes, choose from these great colors - Black with Hunter Green, Blue, Red or Purple stripe. Matching lead available. Sizes: Oversize, Horse, Cob or Pony.